India is one of the world’s hot spots for turtle diversity, representing around 30 species of freshwater turtles and land tortoises. These include the Northern River Terrapin (Batagur baska) and the Red-crowned Roof Turtle (Batagur kachuga) – two of the world’s 25 most imperiled freshwater turtles and tortoises – and the Indian narrow-headed soft shell turtle (Chitra indica) – one of the world’s 40 most endangered freshwater turtle. One of the top three threats to India’s turtles is inadvertent capture and drowning in fishing nets deployed by local fishermen. Fishermen use a variety of nets to capture fish. 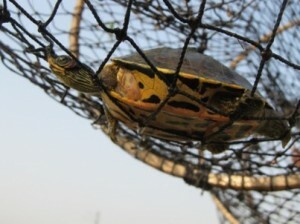 One of the most common is nylon gill nets, which are highly effective at capturing fish and aquatic turtles. Once entangled, the turtles often drown within several hours. Working with the Turtle Survival Alliance (TSA) India program, the EWCL Indian Turtles Team worked to address this threat by developing modifications to hoop nets. The modified nets would allow villagers to catch the fish they need to sustain themselves, while excluding turtles or allowing captured turtles to escape. We adopted four modifications that have been tested in North America but not in Asia. The first involves excluding turtles from entering hoop nets by adding vertical bars at the net entrance. In general, fish can swim through the vertical slits but turtles cannot. This technique, however, may still allow some turtles to enter, especially smaller ones. For those animals, we designed a second modification to allows turtles to escape through a “chimney” at the top of the nets. The chimneys are made of netting material woven into an opening at the top of the nets. Turtles enter the opening and escape through the chimney. Our third modification involves cutting a rectangle in the top of the nets and then closing the opening with loose rubber or string. The idea is that turtles inside the nets would push through the loose weave and escape. The fourth modification involves building an air chamber inside the nets so that entrapped turtles could breathe this air, prolonging their survival until the nets are checked. 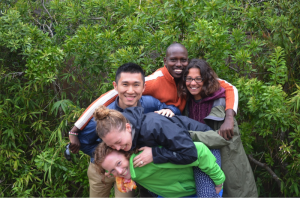 After designing the turtle exclusion and escapement devices for the hoop nets, we used money we had raised through grant funding to purchase the nets, which we sent to India. We then worked closely with TSA India’s local staff to modify the nets according to our designs, deploy the nets, and monitor their success. In June of 2014, TSA India began testing these modifications in two sites in India, each involving different water conditions and turtle species: the Sarju, Ghaghra, and Yamuna rivers. We expected that some modifications would work better than others, depending on the physical and biological factors unique to each site. We plan to continue identifying the most successful modifications, replicate them, and incentivize fishermen to use them in lieu of the gill nets they currently use. Following the deployment of the nets, the EWCL Turtle Team is waiting on more results from TSA India. In December, the staff will conduct further testing on the Yamuna River as water conditions only allowed them to test there for a week in June. In the future, the India staff may also test the nets at additional sites. Our team has begun to write up the results of this cutting edge technology for publication in a conservation journal. TSA tested the net modifications in the Sarju and the Ghaghra in June and September. The June testing deployed nets with air pockets, chimneys, and loose weaves. Despite these modifications, several turtles drowned, possibly because the modifications were not appropriately sized for the turtles in the area. The second round of testing in September was more successful. Several turtles made it past the exclusion devices but used the air pockets to breathe. While this approach seems to prevent drowning, it requires fishermen to check the nets every few hours, and they prefer less labor-intensive modifications. Moving forward, we will experiment with exclusion devices that are more effective at excluding turtles, thus reducing the need to rely on air pockets and chimneys. By adjusting the spacing and pattern of the vertical exclusion bars, we can control the size of turtles and fish that enter the nets. 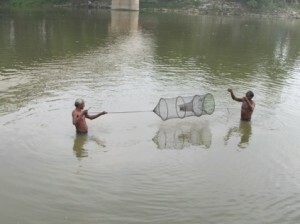 Unfortunately, the modified nets did not catch as many fish as the villagers usually catch. To overcome this problem, we research fish baits and suggested that TSA use soybean cakes, cheese, and other bait that has a stronger scent than the bread they had been using. In the third round of testing, which also occurred in September, the number of fish caught increased with the use of the baits we recommended. TSA tried using both cheese and cat food as bait, finding that cheese worked better. Further, no turtle mortality occurred during this round of testing, although a live turtle was recovered from a net on one occasion. The air pockets and “chimney” escape modifications seemed to work best on both rivers. Extended trials will be conducted over the remainder of the season using other recommended baits such as soybean cakes, chicken liver, peas, and dough balls. 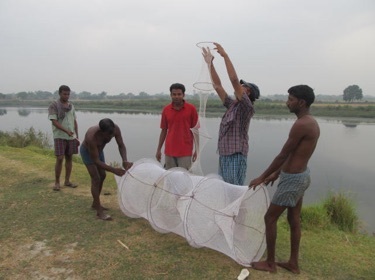 Photos of the pilot testing of fishing gears EWCL sent, on Sarju and Ghaghra rivers. The pilot project is aimed to reduce turtle mortalities at a few selected locations of turtles on Chambal-Yamuna and Ghaghra-Sarju River systems. Support the Turtle Survival Alliance’s India program. The TSA India program is managed by Indian biologists that seek local solutions to saving turtles, which suffer primarily from (1) large-scale illegal poaching for Asian markets, (2) habitat destruction caused primarily by sand mining river banks, and (3) becoming caught in villagers’ fishing nets. Initiatives include converting former poachers to turtle caregivers and providing alternative income sources to turtle poaching. The focal point of this comprehensive program is the iconic and critically endangered red-crowned roof turtle. 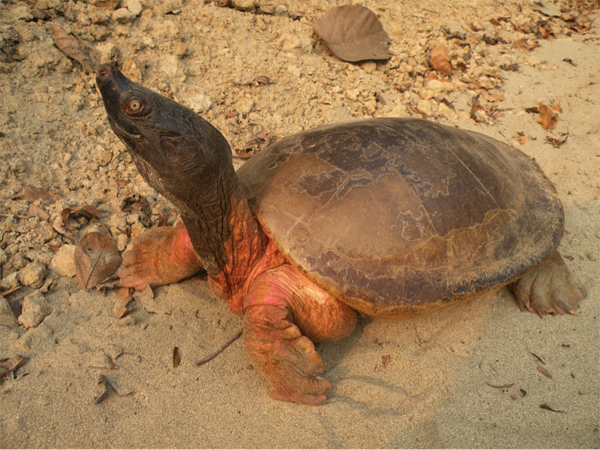 Multiple species initiatives are also underway for the Sunderbans Batagur, narrow-headed soft shell turtle, Leith’s soft shell turtle and the crowned river turtle.